When you choose Family Danz for your home comfort needs, you’re choosing a heating and cooling company that believes in going the distance for our customers, no matter what their needs may be. It’s our pledge to treat our customers like family, and to be honest and helpful to all of our customers. 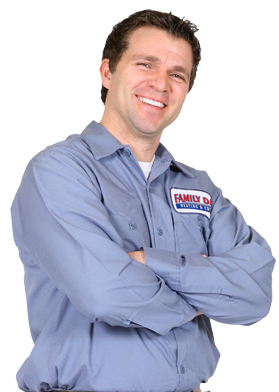 Your first call to Family Danz will show you how we’re a different home comfort company up front. Our knowledgeable staff will answer any questions you may have accurately and politely, schedule appointments according to your needs and attend to emergencies promptly. Once our salesmen and technicians arrive at your home, you’ll notice that we’re courteous, trustworthy and respectful of your property. They’ll arrive on schedule and complete their work in a timely manner. Our installation and service professionals always wear uniforms and floor protectors on their shoes, use drop cloths when needed and clean the work area when the job is done. And, there are never any worries when it comes to the brand of equipment you currently own. That’s because Family Danz’s highly skilled technicians are specially trained to know all types of home comfort equipment, inside and out. We repair all brands and models of heating and air conditioning equipment, and if we don’t stock the part you need, we have the resources to find it if the part is still available. Finally, you can expect that we won’t consider your job finished until you’re happy. Customer satisfaction is our top priority. We proudly stand behind our workmanship and all of our products. It is our goal to make you happy, and we’re not satisfied until you are.